2009! I’ve been going to CPW since it started. I’ve only missed 1 year because physical therapy school was keeping me captive during the week. The campers keep me coming back year after year. Every summer I find that the campers surprise me, with their talent, excitement, creativity, and joy and that’s what makes camp great. I love everything about camp and I start counting down the days to camp probably much earlier than most. I like every theme day…especially the ones that I can be extra creative on a team costume with my camper: green eggs and ham, the front and back of the Toy Story’s Slinky Dog, a team of oompa loompas, evil minions from Despicable Me 2…all of the theme days. Every year I really enjoy watching everyone perform at the talent show. Each person really does have such unique and amazing things to perform and it’s so fun to watch. I don’t know if I can pinpoint an exact moment…but the talent show is awesome. From this last year, we had the color war and that was SO FUN! I so enjoyed laughing and playing and getting doused in color with everyone. I am the fastest hair French-braider in the west! I can do all the braids (well almost all…) and do them all quick, quick, quick! Which is especially helpful in a cabin full of lovely ladies. I am a physical therapist and CPW enthusiast. 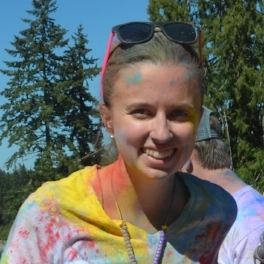 Check out Allison's Day in the Life of A Unit Leader camp testimony here.